Sanna Ruohoniemi | The official website of jazz vocalist & composer Sanna Ruohoniemi. Generous review in German magazine ”Melodiva”!!! Sanna Ruohoniemi ist die jüngste in einer Reihe nordischer Künstlerinnen, die “…successfully melds the open-sky freedom of jazz with the rich folk traditions of her homeland”, heißt es bildreich auf ihrer Homepage. Ihr neues, zweites Album hat die finnische Jazzsängerin mit Joona Toivanen (p), Erik Tengholm (tp), David Bennet (as), Arvid Jullander (b) und Simon Andersson (dr) eingespielt. „Start From Nothing“ heißen Titel und fantastischer Opener und ich freue mich über einen überraschenden Männerchor im Refrain. Im nächsten Song nimmt sie uns mit auf den Mond, was dramatisch und entrückt klingt, „Over The Line“ fördert einen steten sperrigen Groove mit geschmeidigen Bläserlinien zutage. Auch ein finnisches Traditional und einen Song in schwedischer Sprache gibt es (Ruohoniemi lebt in Stockholm). Ihre Stimme hat einen ungemein vollen Klang, erzeugt an manchen Stellen Weite wie im letzten außergewöhnlichen Stück „Solivagant“, was mir persönlich am besten gefällt. In anderen Tracks wird ihre Stimme zum Teil des Bläsersatzes, singt im Duett und improvisiert. On Saturday 8/12, we are playing in Uppsala at Uppala Konsert & Kongress to celebrate 101 year old independent Finland. Just shared the memory of the last year’s concert, that you can view here. I’m happy that all the people in the arrangers side were so pleased that they wanted to book us on this year too, and I’m excited to share the stage with lovely gang, which I’ve been focused to make all the arrangements to… It’s taken some time and effort, as it is something I really want to develop and be better at. Stay tuned for more news in newsletter! Today Friday Galileo records is releasing my album on German market! You can find it here. I had the most precious chance to be able to travel to Sydney and to bring my music and play it there with great local jazz musicians. This a heart warming and great adventure all in all – I’m very thankful for this journey! I deffnitely hope to return to Australia on 2019! My second album is now released and out there to listen on every platform you can imagine. It’s beautiful and I’m happy and proud of it – it surely is made with a heart and soul + some sweat and tears – which happens when you are determined and committed to put yourself out there and to gracefully embrace to bring out the things you fell, hear and acknowledge. I could not have done this with amazing people I have in my life. With my band – my precious music fellows that have played my written songs into real music. I’ve also so happy to be found collaboration with Johannes Lundberg who has done great job with recording, mixing and mastering. Anders Björklund has taken the picture of the cover image, Nova Lock has made the art and Aarni Ylinen the final writing on top of it. It’s all for you to listen. Album release just in a corner! https://areena.yle.fi/1-3262577 and on ”Jazzklubi” kl 18:00 hosted by Markus Partanen https://areena.yle.fi/1-2120710 – tune in! Another song from coming album out! 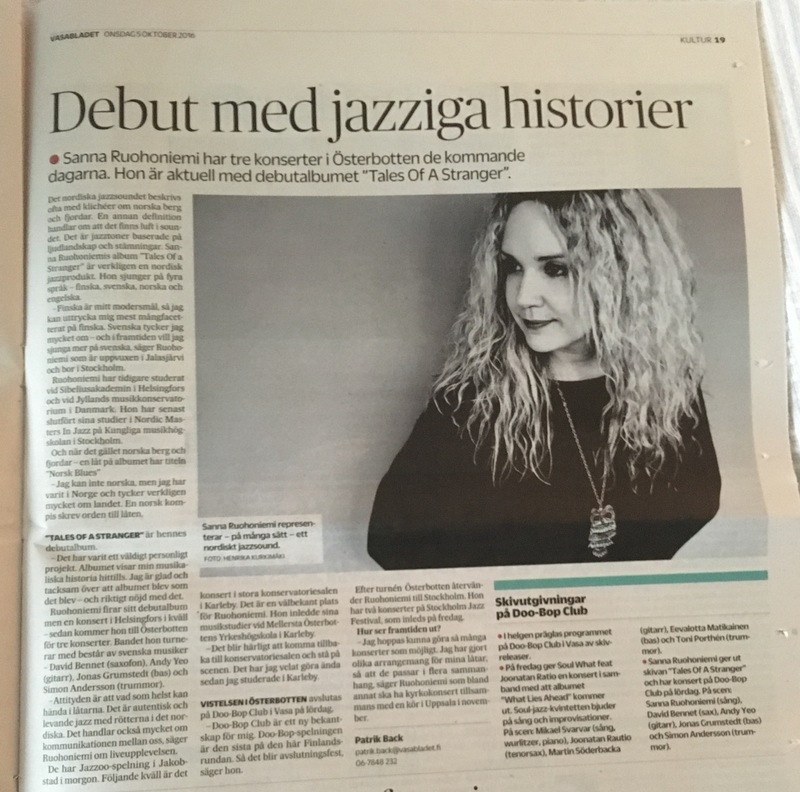 Swedish Jazz focused magazine, Orkesterjournalen, writes about Start from Nothing, and reveals another taste of the coming album – Moon song! Read the whole thing and listen by visiting here. First single of the coming album out and released on Friday 17th August! Have the honor to be representative of ’Finnish minoritet’ in Sweden and play a concert of Finnish tunes that I and we have arranged for jazz band to play. My second album – Start from Nothing, is now recorded @ Studio Epidemin, with sound-engineer Johannes Lundberg and my great band. So happy and thankful, enjoying the process now, excited about what’s ahead! Release on Autumn 2018, tour dates announced under summer! Happy first of April dear folks! No joke – It’s getting closer! 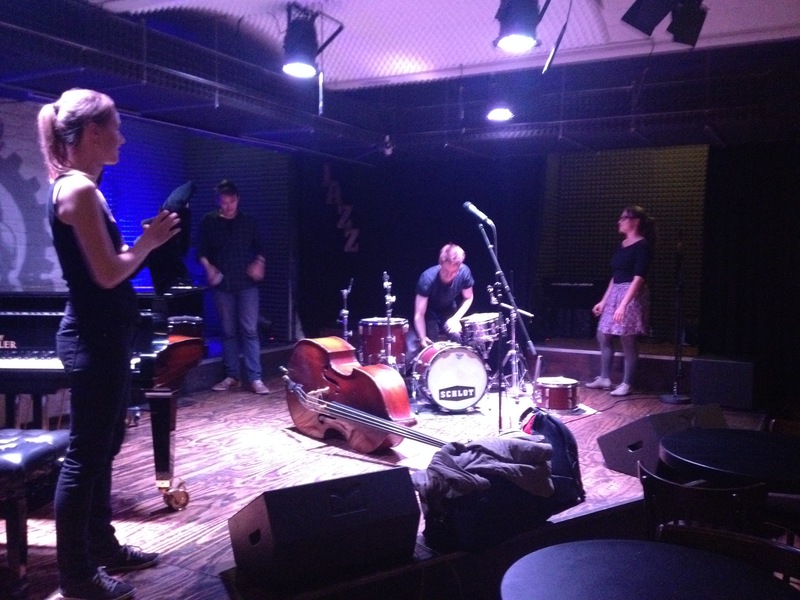 Excited to play at Glenn Miller Café – time to test some of the new tunes before hitting to the studio @ Göteborg ! My next album ”Start from Nothing” has almost revealed itself as form of 9 songs and really SOON it’s time to head to Göteborg to record it with phenomenal producer, bassist & music creator Johannes Lundberg at Studio Epidemin. I’m honored to play with the best musicians I could possibly think of doing this album with, and tho I’m afraid, I know that it’s the excitement and the meaningfulness of this project that’s behind it. ”Start from Nothing” has a lot of thoughts behind it referring to my own steps I’ve taken. Steps from a place you know you should not be in. Steps towards something new. Observing what you’ve learned within. Foremost it gathers up an important message: Every day you need to start from scratch. It’s not the previous things, songs, gigs, life situations – it’s about the small acts you do now that counts, the bravery to put your own personal imprint to share with the world. I’m so excited about this upcoming record and upcoming things with it and I’m so excited to be able to share the music created. The release of the album will be on Autumn 2018! Lots of things building up for the near future! Also a concert in Uppsala on coming on Sunday – excited to play live some new songs I’ve composed and which we have been working with under past two months. I’m so excited to share the info about my next album, which is going to be recorded on April at Studio Epidemin in Göteborg with Johannes Lundberg, with amazing band of mine, now added with pianist Joona Toivanen and trumpetist Erik Tengholm. Getting ready for Christmas by rehearsing lovely Christmas songs – here one of my favorite, beautiful ”O helga natt”, orig. ”Cantique de Noël” by French composer Adolphe Adam from year 1847. Another great ”Muistojen boulevard” -concert, this time in Motala Folkets Hus, Sweden in a lovely theatre local! Programme of traditional Finnish music arranged mostly by me for the jazz quartet / quintet setting. 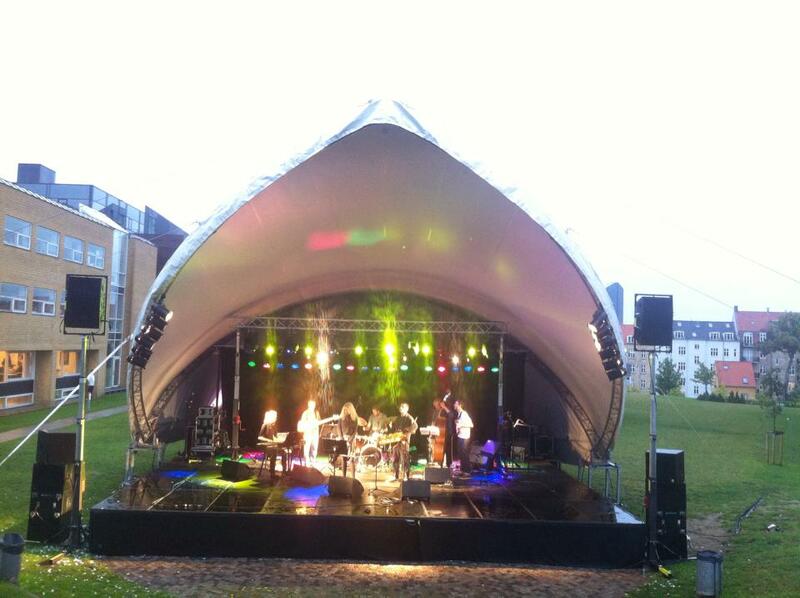 Works well, such an outstanding evening we had at UKK! Thank you for having us! Jazzcafé concert at Årsta church, Uppsala in very good company! 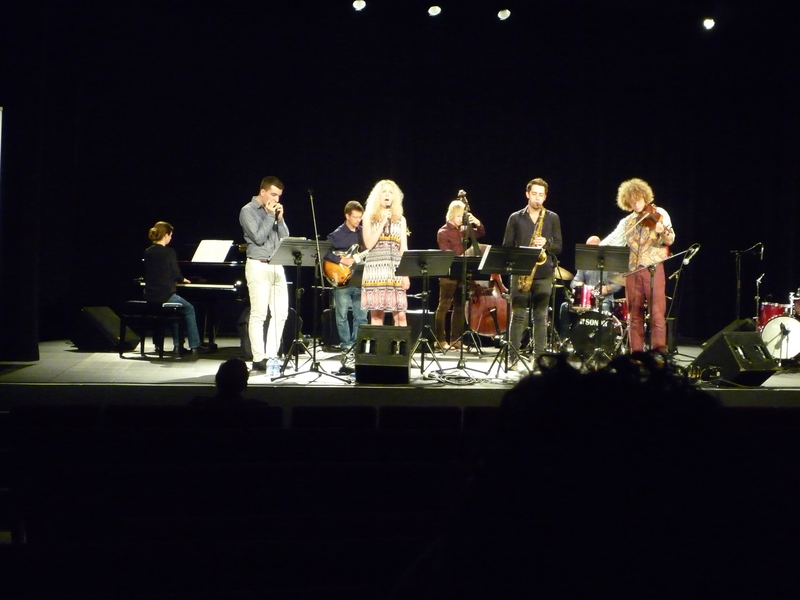 Bring jazz to the library, particularly to Hornstull, Stockholm! I’m blessed to be able to play so much music in my life. This means I sing and play a lot! Also solo. Accompanied by an organ, too, but mainly by piano. 🙂 This one is from Vaksala church, Uppsala, music programme with theme ”Ljus” – ”Light”. Hellsten gig was a flying succé! So good to play with these humans! Concert in Stockholm, Hotel Hellsten – Jazz på Hellsten coming up! What a band I’ve got! Concerts & coming venues updated! Jazz at Bluesbaren, Stockholm! Playing jazz standards is one of the best things ever. Particularly in a good company like this! So nice and flowing. So good energy, great musical gathering and warm, welcoming audience we had as playing music of the album ”Tales Of A Stranger” in Turku, Finland! Pure love!! Thank you Flame Jazz for having us! Greetings from Germany! Good to be here again, have had very warm welcoming with all the audiences and great & explorative concerts with Antje Rößeler and Birgirtta Flick. Jazz i Parken took place in Göteborg, Slottskogen on first of July. I had the joy to be part on this really nice festival to perform my own music with my band. Thank you everyone who shared this nice event! Next gig in Stockholm, Nynäshamn guesthamn tomorrow Wednesday and then on Sunday 9.7 in Helsinki at Tenho Restobar! Check more info from gig updates. Hope to see you! Lovely spring greetings from Stockholm! My music has been broadcasted on NRK Radio, Norway, check out via here! Now also concert schedule updated – stay tuned for more gigs coming during summer and fall 2017! Spring is here with all the songs of the birds and blossoming nature – really powerful period of new growth, you can really feel the amazing energy all around us! I’ve been working with many projects and also doing some concerts during the spring – next gig coming at Bluesbaren at Södermalm on 19/4. 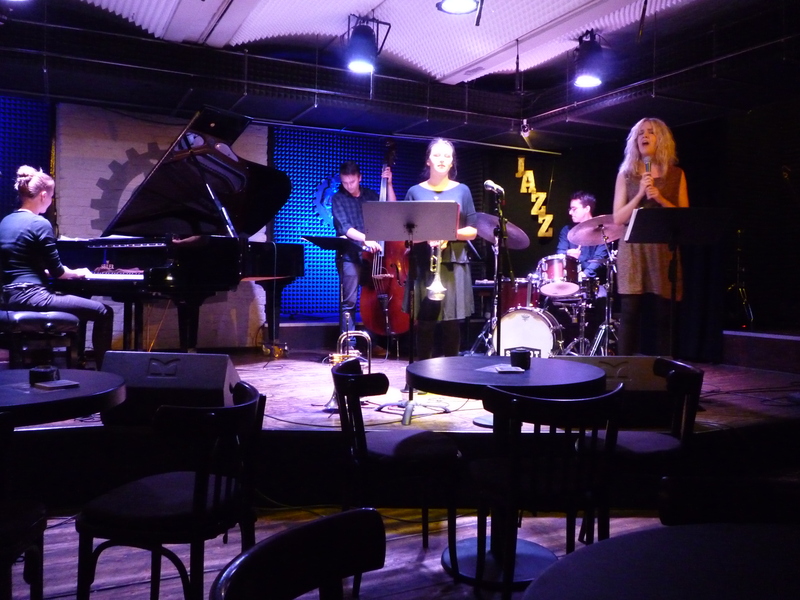 Then a festige for Finlands 100 year-celebration year project continuing after a great success with concert in Uppsala last week – and late of April I will have my first discovery trip to JazzAhead, Bremen. Looking very much forward to meeting all the new people from the music branch around the world! Stay tuned with the upcoming events! 2016 – What a beautiful year – full of life, love, lessons (learned) and music! Feeling grateful and happy for every bit of it and now embracing the new one with open arms and crazy excitement! Happy New Year You All & my warmest thanks for being part of this journey; supporting, coming to gigs, listening the music, buying record(s), interacting, creating music with me and just being there for me! Without sharing this all with others it would be pointless. Pohjalainen gives five stars for Tales Of A Stranger!!! After moving away from home, living and studying abroad, I started to naturally reflect more on my past experiences. I didn’t know it at the beginning, but upon exploring from a wider perspective, it’s clear that these past two year of studies have made me reflect on all my experiences of being a musician and discovering music as a whole. The journey has been versatile, has had twists and turns, but big things have happened to me and my life during this two-year period of studying in three different environments. In these two years, I have undergone many changes: change of place, school, people I am surrounded by, teachers, musicians I play with, but also changes in my focus in who I am and what I carry in my musical background. This has all contributed to what am I singing about on this record and why. It’s been quite an experience already to make this record happen, I’m happy and grateful and looking forward to play this music live. I’m also really glad to bring my Swedish band to Finland to play! Hope to see many of you in our concerts! The record is done and its here and its ready to be released! I cannot even tell how excited and thankful I am of all this process. It’s been an adventure until now and I’m looking forward what’s there ahead of me next! Really happy to get my record out there, excited to play this music to You and also to be able to tour with these great musicians who made this all real and happen with me (the guys from my band haven’t been in Finland, yet!). Hope to see as many of you there in the concerts! Warmly welcome! Heading tomorrow to Berlin for two weeks! Playing my music with wonderful people for four concerts. After these gigs I will be singing in Antje Rößeler’s group for four nights more in Berlin and elsewhere in Germany. On Thursday we are playing some Finnish & Swedish traditional songs from jazz / schlager songbook with new cool arrangements + some of my own tunes also from the record that’s going to be released on October! Enjoying lovely summer and preparing for upcoming concerts; soon traveling to the North of Sweden, Luleå, to play (I even take my violin with me!). Then two concerts in Sweden and after that traveling to Germany to play and record. Really happy and grateful for these opportunities and to get to work with different kind of projects and great musicians! Things also look really good for my coming album release: The co-operation with sound engineer Erik Metal has been great, and I’m really happy of the result how the record sounds. AND: I have made a record deal with Finnish record label, the first and the best option that I could have imagined, which is going to release my debut album on October! I’m super glad about this and so excited to see what kind of receive it will have! Also excited to travel to Finland to play with my Swedish band. Summer gigs updated! Check out more on LIVE -section. I was interviewed by Laura Santala to this weeks 26/5 Ruotsin Suomalainen magazine. Had a great collaboration concert with musicians of my band and dancers Tove Brunberg and Anna Ehnberg last week 28/4 at UusiTeatteri. We continue with this collaboration on coming summer / autumn, as we have two events coming at Scala teatern, Stockholm, on August 2016. Many sort of things happening here within the coming spring! Have had really nice gigs with my band and with pianist Joel Lyssarides. Also last week we recorded our album, which is going to be released in october 2016! I’m into this project with all my heart and soul, so just enjoying and feeling excitement and joy of all the steps of the process and working with and for it the best I can. Of course couldn’t do this alone, big thanks goes to my band and other ”medverkande”. Record release turné is going to take us to round Finland and Sweden, also to Estonia – hopefully in Norway and Denmark too! Booking is still on. FASCHING on 29th of February, kl 20:30! I am ready and set and so much thrilled to play at one of the most significant jazz venues of Sweden! We will be playing my original tunes, including both old and new material that’s just been composed and rehearsed with my band, which includes these great musicians: David Bennet, sax; Andy Yeo, guitar; Jonas Grumstedt, bass and Simon Andersson, drums. Be sure not to miss this! Otherwise been busy rehearsing for the recordings & gigs. Before Fasching I’m playing three concerts next week, one with my quartet and two with Joel Lyssarides on piano. More info aboutthose on the LIVE -section. After a wonderful christmas break back home in Finland, I landed to Stockholm and it already feels like I never went away. Have lots of fascinating things ahead me, which I’m really excited about! I’m now working on my FIRST ALBUM which is going to be released on this years autumn! I cannot tell much more right now, but there’s going to be some really interesting guests with our familiar Stockholm quartet playing on our album! There’s going to be some really nice concerts also in the near future: first big one ahead is at Stockholms biggest jazz club FASCHING on 29th of February, where we’re going to introduce some ”tastes” of the coming album also. Had great november concerts here in Aarhus and also spent one day in studio. Some demos coming up soon! Aarhus turné coming up this week 27.11-30.11. I’m thrilled to play three concerts in Aarhus next week! The quartet consists with local musicians (Jens Mikkel, bass and Frederik Bülow, drums) and one from my original Swedish group (David Bennet, alto sax). It is exciting to see how these songs of mine will turn out with this band setting. See more info from the LIVE -section about the concert dates and places. Now that even whole Aarhus is covered with snow, I want to sum up my autumn period in here. I must say the fall has been more than interesting with all the Danish vibe added from school, local music, playing with locals and just enjoying, studying and living life here in Aarhus. It’s been really different autumn in many ways for me and I’m more than happy to sing and play my music I’ve wrote to people. I’ve been very much inspired to sit in front of piano and compose new material for my up coming album next year. And I’m more than happy to sing and play those tunes now to people that I’ve been writing. I’ve have had the most valuable lessons here at school that I could imagine, for which I’m already so grateful to have experienced. Thanks goes for Søren Nørbo, Jakob Buchanan, Bebiane Bøje and Christian Vuust. 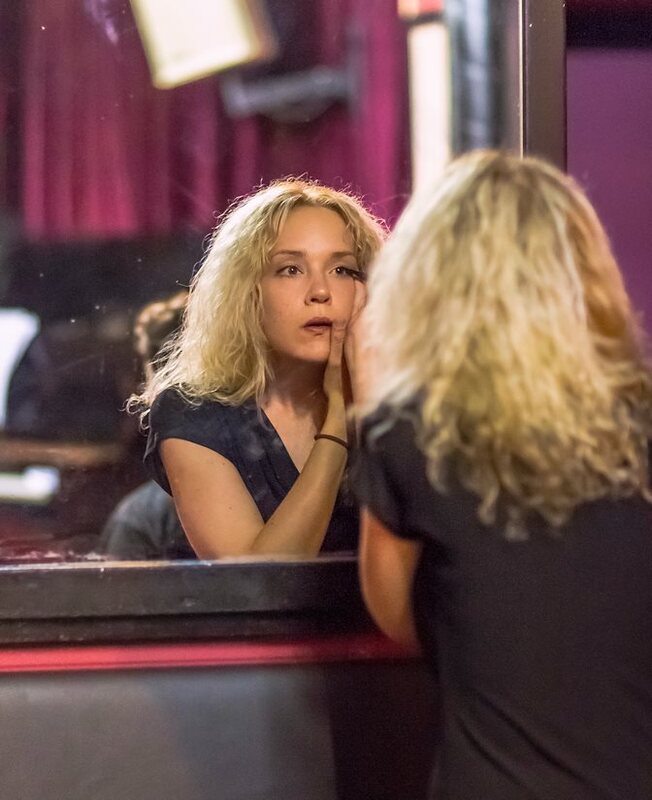 The topics of the music and the lyrics are really much together, consisting life lessons I have been put to go through or that I really needed and wanted to face myself. Hopefully also some lessons learned. The basic of the stories is always the love and the joy of living. And the reminder for mostly myself (among hopefully for some listener too:)) is that life is exceptional thing. We should really jump in it while we are here. Discover our fears and deepest dreams, wants and passions. Strive up the good in us and open ourselves for the possibilities. Hope to see many faces at our Aarhus gigs! You’re most warmly welcome. Here’s some picture taken after our Hellsten gig at Stockholm. Have really good wibe from these fine musicians, it was (again) pleasure to play with them! David, me, Simon and Jonas. Playing four concert in Stockholm and nearby from 5th of November to 8th of November. Check out more info from LIVE -section. 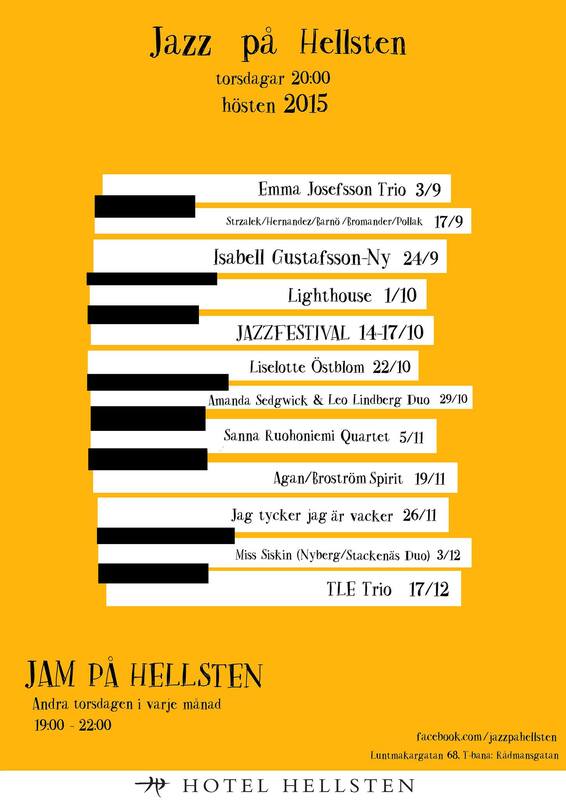 Here’s the add of the Jazz på Hellsten -concerts. We play there on Thursday 5th of November kl 20-22. So happy to be re-united with my Swedish quartet to play and excited to try out the new songs that I’ve been preparing in the autumn period! After playing few gigs in Aalborg, Denmark, I landed to Aarhus. The past month living and studying here has already been full of fascinating and great experiences, people and studies! After settling here, I’ve been playing with many great musicians and also having pleasure to take part of interesting projects and play few concerts. 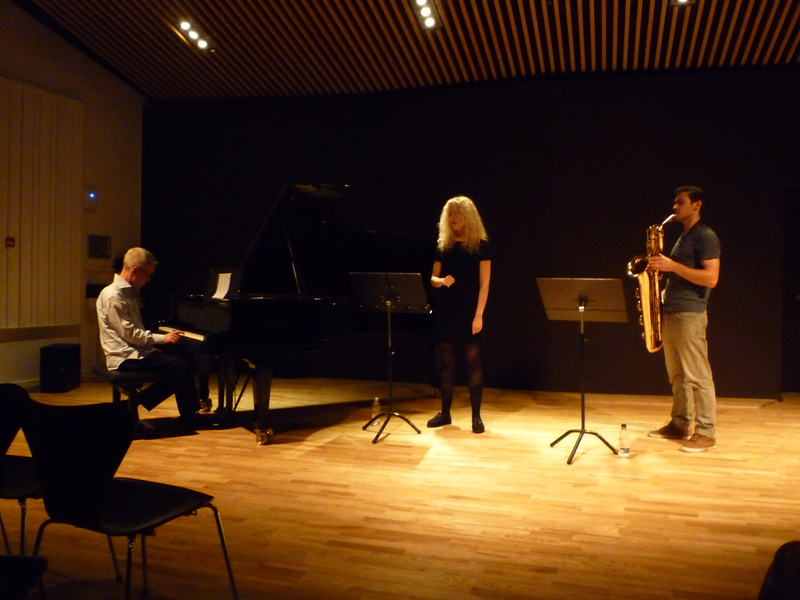 One of those took place on 23th of September when I had the joy to play a concert with a great Danish pianist & composer Søren Nørbo and a fellow student saxophonist Benjamin Hermans from Belgium. Check out the LIVE -section, there’s some new updates! Next concert already on Saturday 3.10.2015 and after that I’m excited to sing some Brazilian music with konservatoriums big band! All in all – full of urge to SING and ideas to compose new songs – exciting things happening and for sure coming up! Say tuned! Concert with Søren Nørbo and Benjamin Hermans at Kammermusiksalen, Musikkonservatorium, Aarhus. Concert part of the Rytmiske festive koncerter 2015 in Aarhus, Denmark. 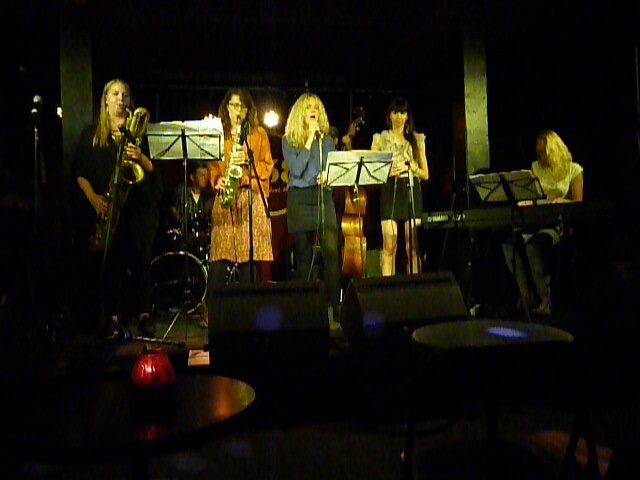 Girl power in jazz -ensemble concert at V58, Aarhus. 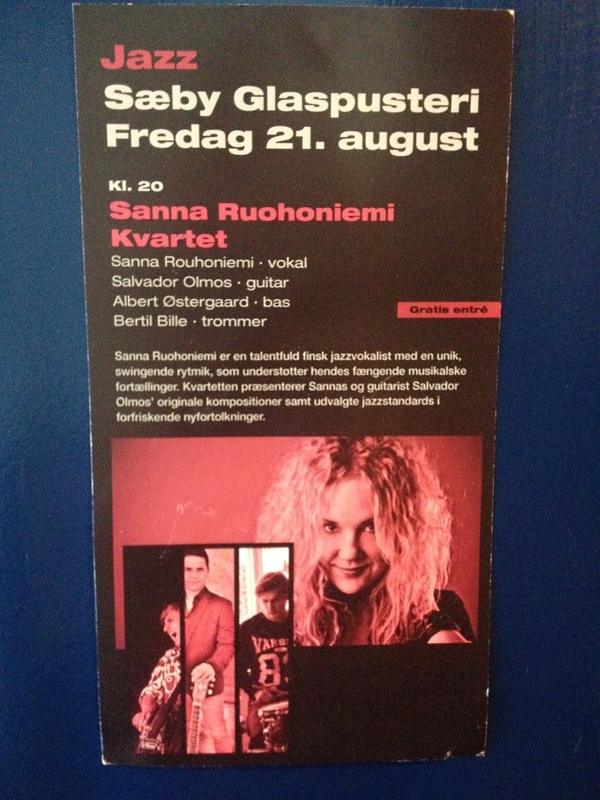 Poster of concert at Saeby, Denmark. Concert at Susan Himmeblå, Aalborg, Denmark with Salvador Olmos (gtr) and Adreas Schmitz (bs). Enjoying Finnish summer in Helsinki. Next week I’m off to Denmark to play three concerts at Blå festival, Aalborg. So excited! Check out LIVE for details & come to listen, if you’re somewhere nearby! New recordings from our quartet. Love this beautiful ballad, and love my band! New album coming on spring 2016! The past two-three weeks has been full of amazing experiences for me. 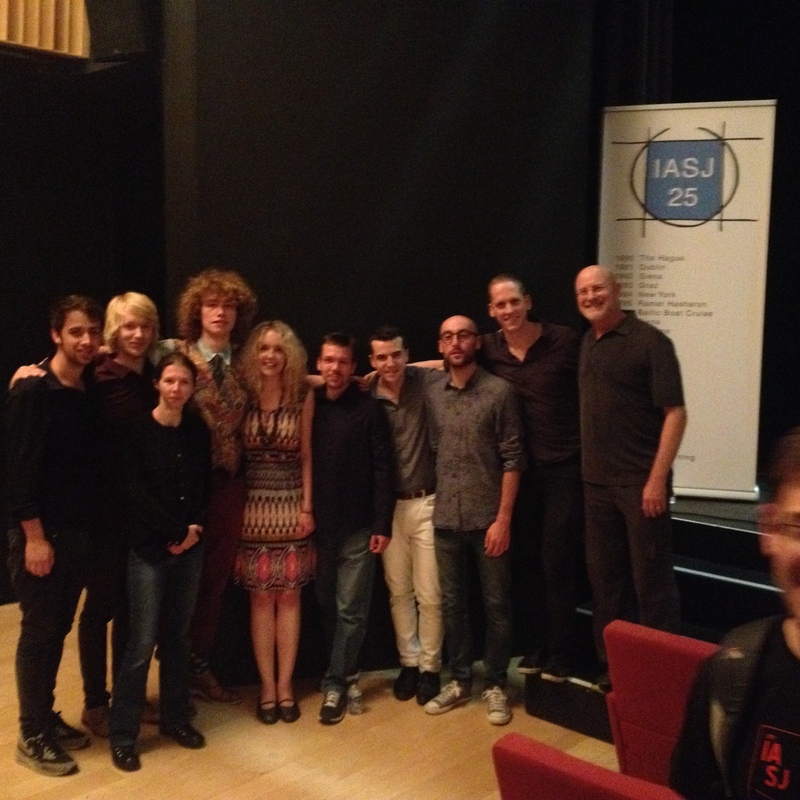 I got the chance to participate in annual IASJ which was held this year in lovely settings in Lisbon, Portugal and had the joy to meet and play with great jazz musicians all over the world. During this week we had masterclasses, ensembles and every night jam sessions. In the end we had ensemble concert and played original compositions of the members of our group, mine ”Tale of a stranger” included! 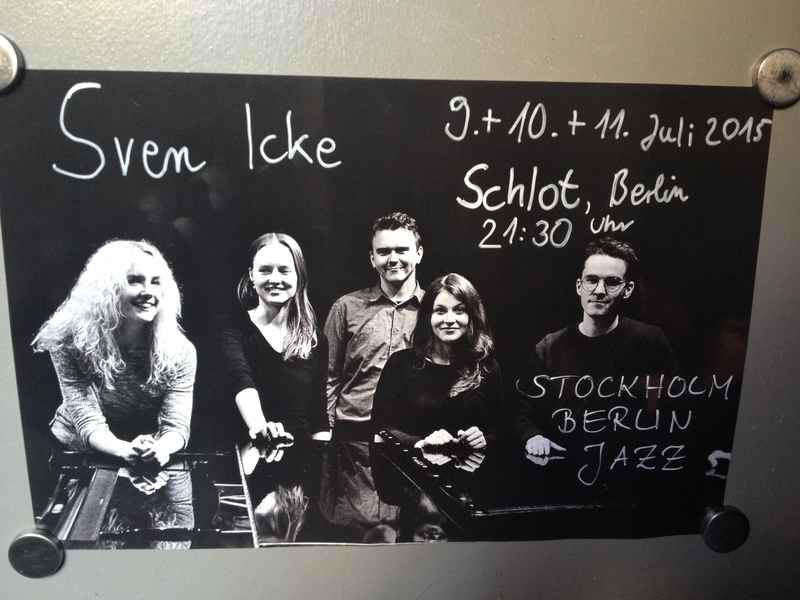 After couple of days at home in Helsinki I flew to Berlin to tour with our German-Swedish(-Finnish)-project Sven Icke and had three gigs in Berlin and two around Dresden. What a week! Great gigs, lovely venues, friendly precious staff & people! Soon it’s time so say goodbye to lovely Stockholm and people in here. But only for a while – I will be back soon! I have enjoyed my time in here so much and got to know and play with so many wonderful musicians, met genuine, open, warmhearted people and got guidance from very wise teachers with a wide knowledge and views of music and life in general. I could not be more thankful and happier to start the summer! Stay tuned for the events of the summer, there’s going to lots of things happening. 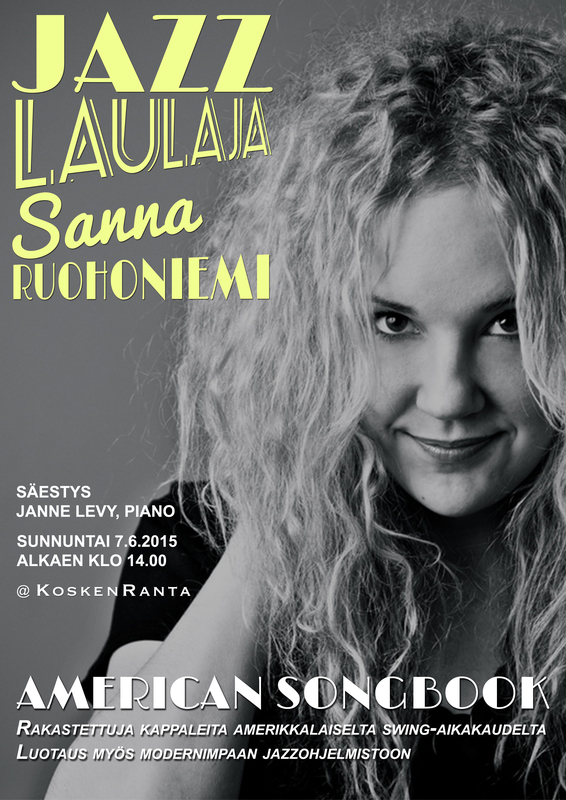 First a lovely gig with a ”American Songbook” as a theme on 7.6 starting from klo 14.00 at Koskenranta. Janne Levy on piano! Welcome! Sanna Ruohoniemi Trio konsertoi tiistaina 5. toukokuuta Tukholman ytimessä, Kulturhusetissa! // Concert at Kulturhuset! We are ready and eager to play at Stockholms hjärta – Kulturhuset, at Ekoteket! So happy to be part of the promotional concert serie of Kungliga Musikhögskolans annual jazz festival New Sound Made with this awesome group of mine. The concert will take place at the daytime kl 12.00. On Thursday I’ll be traveling to Finland, and on Sunday 10.5 we have a concert at Arkadia Bookshop with Antje Rößeler (piano) kl 14.00. Huumaava Tukholman keväinen vehreys! // Lovely spring here in Stockholm! Great concerts last week, and also tonight with so fine Filipe Raposo on piano at UT Bud, UusiTeatteri. Tack ska ni ha; Jukka, Satu, Anna-Maija och Pekka. Det var trevligt igen och många härliga människor som jag träffades idag! Also LIVE part updated! Next venue at Staten Musikverk / Biblioteket, Bonnier hus, Torsgatan 21, Stockholm, klo 16.00. Welcome! Tällä viikolla mm. konserttitreenit trion ja tanssija Tove Brunbergin kanssa. Uuden edessä – niin mahtavaa, haasteellista ja inspiroivaa! Pääsin myös kertomaan konserteistani ja arjesta Tukholmassa sekä Sisuradioon että Ruotsin Suomalainen -lehdelle. Some new concert venues in Stockholm – kaksi konserttia tulossa heti pääsiäisen jälkeen! Oooo I am a lucky girl! Living my dream and really excited of everything that’s coming up! Two concerts coming right after easter, tuesday 7.4 and Wednesday 8.4, which are quite special for me. I have a chance to sing with these really splendid musicians Samuel Löfdahl and Simon Andersson. First we play at UusiTeatteri (Hälsingegatan 3, metro: Odenplan) on Tuesday 7.4 at 7 pm. There we also have amazingly talented and expressive dancer Tove Brunberg joining us on the stage. Really looking forward what’s going to happen! After that we play a lunchconcert at Kungliga Musikhögskolan on Wednesday 8.4 klo 12.30 (KMH Lilla Salen, Lidingövägen 12, metro: Stadion). Both concerts are free! Come to hear us if you have a chance. Kevään uudet tuulet ja duo! Pohjanmaa hoi! Meillä on vastikään perustettu duo Etelä-Pohjanmaalla laajasti musiikin kentällä toimivan mahtavan ja monipuolisen kitarataiturin, Antti Honkasen kanssa. Uutta ohjelmistoa kesän keikoille treenataan ensi viikolla saapuessani lakeuksille! Ensimmäinen keikka Tukholmassa takana. Kiitos UusiTeatteri, yleisö ja erityisesti teatterin henkilöstö – Jukka, Pekka, Anna-Maija ja Satu.Oli lämminhenkinen ilta, upeat puitteet ja kerrassaan loisto palvelu! Saatiin ihanaa ja kiitollista palautetta ja kaikenlaisia ideoita mielessä tulevan kevään varalle. Tervetuloa upouusille sivuilleni jotka sain vihdoin puskettua eetteriin. Tällä hetkellä päivitän kuulumisiani ihanasta Tukholmasta! Kaikenlaista jännää luvassa täällä Ruotsinmaalla. Stay tuned!